U.S. Go Congress attendees can get a head start planning their activities in Tacoma by downloading the Congress Handbook, which includes the complete schedule of events, details on the tournaments, bios of the professionals, activities for non-players, maps and more. 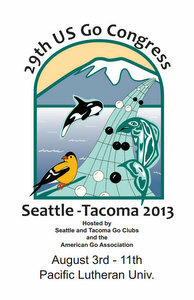 The 2013 U.S. Go Congress starts this Saturday and runs through August 11. And for details on how to get to the Congress site, click here and check out “How do I get from the Airport to the Congress site?” or click here for driving directions.